This year’s Stanley Cup Final got underway on Monday night in Vegas and it was pretty insane … even by Vegas’ standards. It was the Golden Knights who managed to jump out to an early 1-0 series lead thanks to a 6-4 win over the Capitals, but this has the potential of being a riveting series that goes down to the wire. Here are some quick takeaways from Game 1. One of the most impressive things about this Golden Knights team is their ability to suffocate the opposing team’s offensive attack – just ask the Winnipeg Jets — and that was on display early in Game 1. The Capitals needed nearly six minutes to get their first shot on net, and they were held to just a single shot on net for over 13 minutes to start the game. 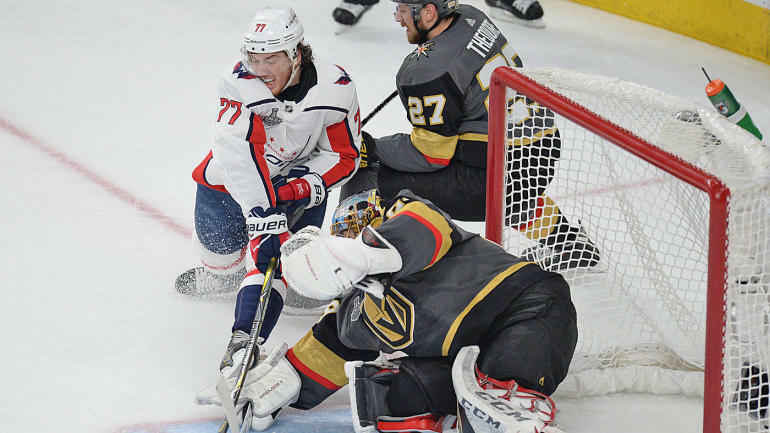 The Golden Knights were quicker and more tenacious out of the gate, but the Caps were able to fight through that slow start and get their offense going — including striking for two goals in 42 seconds toward the end of the opening frame. Ten goals. Four lead changes. Never separated by more than one goal until the empty netter. This game was highly offensive, supremely entertaining and intoxicatingly competitive. It was also historic, as it was the first time a Stanley Cup Final game ever featured four lead changes. Strangely enough, none of the 10 goals came off the stick of Alex Ovechkin, who only had two shots on net, though he did have an assist in the game. If this game was any indication, it’s going to be a high-event series with plenty of offense and highlight-worthy action. But, yes, let’s please hear about how the Golden Knights being here is bad for hockey! In any case, you should probably bet the over moving forward. This game crushed the 5.5 O/U in the first 30 minutes. If you were hoping that some bad blood would be established in the early going in this series, Game 1 delivered some of the ugly stuff. There was plenty of physicality and chippy play, and not all of it was legal. Things particularly seemed to escalate in the third period. Ryan Reaves got away with a blatant cross-check to the back of John Carlson in front of the Washington net right before scoring a goal that tied the game at 4-4. It was an egregious missed call by the officiating crew. After the game, there was plenty of chatter about Wilson’s hit on Marchessault, and some discussion about possible supplementary discipline. Ryan Reaves on the Wilson hit on Marchessault: "it was a late, blindside hit like Wilson always does." Wilson’s account of the exchange didn’t really line up with what the Golden Knights’ forward had to say. Reaves and Wilson are two guys that aren’t afraid to mix it up at any given opportunity, so we’ll see if the animosity they helped stir up carries over into Game 2. Both teams got depth contributions, but the Golden Knights’ fourth line was outstanding. Those players made the difference down the stretch as they accounted for three goals — one from Reaves and two from Tomas Nosek — all of which came in the third period to help seal the win for the Golden Knights. Nosek and Pierre- Edouard Bellemare were a plus-3. Meanwhile, Lars Eller had a night to forget for the Capitals. Not only did he finish as a minus-3, but he also whiffed on a golden opportunity to tie the game in the final seconds in front of a wide-open net. Not ideal.